The Pinotage Club: What did I learn working at LIWSF? So what did I learn from pouring Top 10 Pinotage at the London International Wine & Spirit Fair? WoSA and their staff do a tremendous job – glasses were constantly replenished. Visitors to the stand fell into 4 distinct groups. Those studying for wine certification, especially Master of Wine and the Wine & Spirit Education Trust Diploma, who tasted all 10 wines to help understand the variety and appreciated being able to do so on one stand. Winemakers from other countries – especially France, Spain and eastern Europe – who were fascinated by the wines. Restaurateurs, sommeliers and independent wine shop owners looking for good wines that are not available in supermarkets – being competition winners elevated the wines from the others. For those wines for which I didn’t have distributor information I took the business card of the enquirer and contacted the winery via the Pinotage Association. Everyone else: those new to South Africa wines, those that liked Pinotage and wanted to taste the winners, those that thought they didn’t like Pinotage and wanted to check again, passers by – the Pinotage Association stand was on a corner of the main WoSA exhibit in the centre of the hall so almost every visitor passed it at some time. 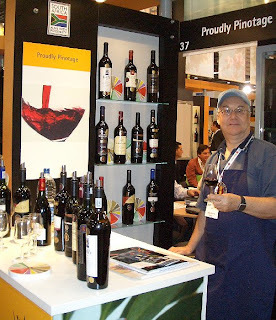 It was tremendous fun, but hard work, pouring Pinotage for three days from 09:30 to 18:00. Why specifically the left side of the table? Amazing how people think - you have to tell them the best Pinotage ... Can't they decide for themselves? I would love to experience that oneday. I didnt go this year. I woke up on the Tuesday and just couldn't face it. Feeling guilty as I always enjoy the Pinotages you pour with such expertise.